The first stage of SpaceX's Falcon 9 rocket sits on the deck of the droneship "Of Course I Still Love You" seconds after landing successfully during a May 27, 2016 launch. SpaceX has just scored a rocket-landing hat trick. 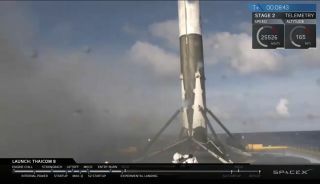 The first stage of the company's Falcon 9 rocket came down for a soft touchdown on a ship at sea today (May 27), during the successful launch of the Thaicom 8 communications satellite. Until last month, this dramatic maritime maneuver had never been done; SpaceX has now pulled it off on three straight flights over the last seven weeks. Less than 9 minutes after liftoff, the Falcon 9 first stage made a pinpoint vertical landing on the deck of "Of Course I Still Love You," one of SpaceX's two "autonomous spaceport droneships," which was stationed 420 miles (680 kilometers) off the Florida coast. When the smoke cleared and it became evident that the rocket was still standing, SpaceX employees at the company's headquarters in Hawthorne, California erupted in raucous cheers. A successful touchdown was by no means assured. GTO lies far from Earth, meaning the Falcon 9 had to move pretty fast to get Thaicom 8 there. Indeed, today's touchdown put a significant amount of strain on the rocket stage, said SpaceX's billionaire founder and CEO, Elon Musk. "Rocket landing speed was close to design max & used up contingency crush core, hence back & forth motion. Prob ok, but some risk of tipping," Musk tweeted today. SpaceX personnel will likely head out to the droneship soon and — provided the booster does indeed stay upright — weld it to the deck of "Of Course I Still Love You," to stabilize the rocket for the journey back to shore. SpaceX pulled off a similarly difficult droneship landing just three weeks ago. On May 6, the Falcon 9 first stage touched down on "Of Course I Still Love You" during the launch of the Japanese communications satellite JCSAT-14, which also went to GTO. These experimental landings are part of SpaceX's effort to develop fully and rapidly reusable rockets, a key goal of the company. Indeed, Musk has said that such technology could slash the cost of spaceflight dramatically, perhaps even making Mars colonization economically feasible. SpaceX isn't alone in this line of thinking. Blue Origin, the spaceflight company run by Amazon.com founder Jeff Bezos, is also developing reusable launch systems, and has launched and landed its New Shepard rocket three times since November 2015. Blue Origin's successes all came during suborbital test flights, whereas SpaceX's landings have occurred during orbital launches. Thaicom 8, which has a design lifetime of 15 years, will ultimately make its way to a circular geostationary orbit and provide communications services for South Asia and Southeast Asia, SpaceX representatives said. The 6,600-lb. (3,000 kilogram) satellite was built by Orbital ATK and will be operated by the Bangkok-based company Thaicom.